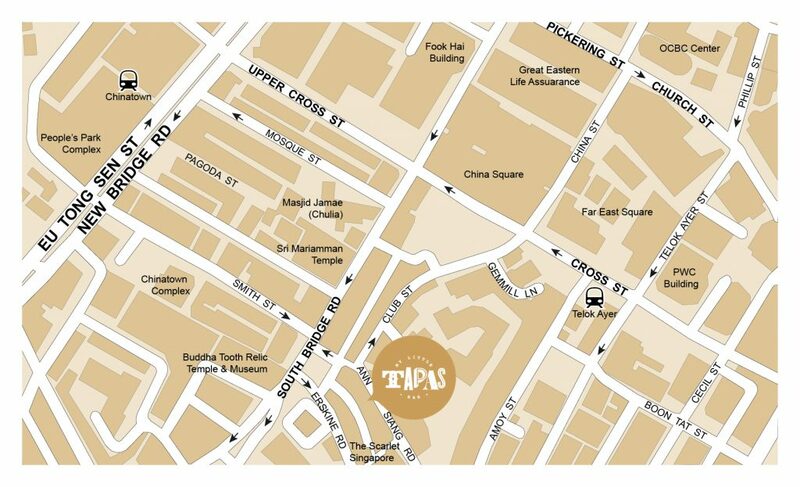 My Little Tapas Bar is located along a row of shophouses facing Ann Siang Hill, a short walk from the multi-storey parking available at the URA Centre. Street-side parking lots are also available along Ann Siang Road and Club Street, but are limited. An open-air carpark is also located at the far end of Club Street, at the junction of Club Street and Cross Street. The nearest bus stops are along Cross Street next to Telok Ayer MRT, opposite PWC Building. Bus services that stop here are numbers: 186 and 970. And along South Bridge Road, opposite the Sri Mariamman Temple. Bus services that stop here are numbers: 61, 166 and 197. The nearest MRT stations are Tanjong Pagar, on the East-West Line (8 mins walking distance); Telok Ayer, on the Downtown Line (6 mins walking distance); and Chinatown, on the Downtown / North-East line (10 mins walking distance).